An intricate network of walking trails will allow visitors to enjoy the forest habitats and marvel at the diversity of plants that can thrive in the Pacific Northwest. Trail signage and an interpretive shelter will profile the Pacific Rim regions represented in the new gardens, highlight their horticultural connections, and illustrate the vital importance of plants in different societies and ecosystems. A Conservation Garden: A key feature of the Pacific Connections Garden is that all of the plant material in the new forests will be propagated from seed collected in the wild. The UW Botanic Gardens is conducting expeditions to collect seed for the new forests. Using wild-collected seed of known provenance in the new garden will allow Arboretum staff to practice ex-situ (or off-site) conservation of plant species that are threatened—or may become so—in their homelands. It will take about a decade to complete the design and construction of all the forests in the Pacific Connections Garden—and it will take many more years after that for the garden to grow and mature into a finished display. The idea for the garden was laid out in 2001 in the Arboretum Master Plan. 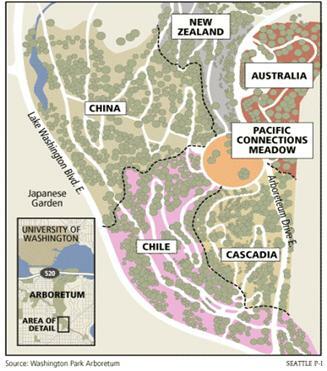 In 2003, the Arboretum Foundation launched the Pacific Connections Campaign, an ambitious fundraising effort to raise more than $15 million in public and private funds to build the new garden and establish an endowment for maintenance. In concert with garden construction, the campaign is being coordinated in different phases. Pacific Connections Future Phases: Campaigns to fund the construction of the remaining forests (Chile, China, Australia) will be launched in the near future. Make a gift to Pacific Connections. To learn more about the project, please contact our Interim Executive Director, Jane Stonecipher, at jstonecipher@arboretumfoundation.org or 206-325-4510. Seattle Parks and Recreation Web Page for Pacific Connections. “Sprucing Up a Place For Plants,” Seattle Times, October 2007. “Big Changes Coming to the Arboretum’s South End,” Seattle P-I, May 2007.